I have given links to some files which were Getting started list for learning concepts in Tally.ERP 9 in my earlier post. I don't know if so much of tutorials would be available then how much can be learnt and upto what extent it can be understood. In the Getting started list there was one tutorial related to Excise accounting for Manufacturers in pdf format. For those who have not learnt here is another option in form of slide show. Here is an slide show version of same tutorial which is better explained with examples easy to understand. The Presentation starts with understanding the concept of Excise, How it is levied, different types of duties m their valuation methods etc clearing all the basic concepts. 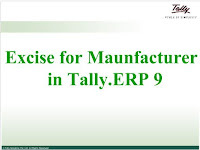 It further explains the challenges in excise accounting and tells how this is done in Tally.ERP 9 by explaining with relevant industry examples. You can download this slide show for your future reference and personal use. The slide show is prepared by Tally Solutions and presented here just for educational purpose.